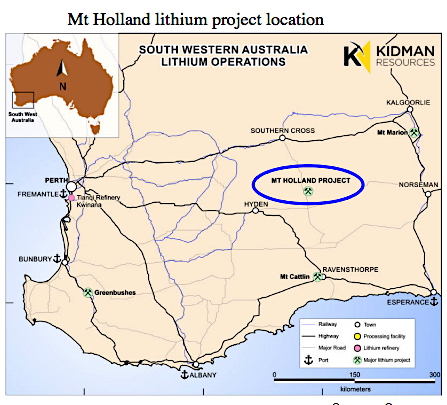 Australia's Kidman Resources (ASX: KDR) and Chilean partner SQM (NYSE: SQM) may lose their right to develop their Mount Holland lithium project in West Australia after a ruling issued by a unit of the state government in charge of mining leases. On Wednesday, West Australia’s Warden’s Court urged Mines Minister Bill Johnston to refuse Kidman’s request to be exempt from minimum expenditure obligations over 13 mining tenements held by its subsidiaries. The recommendation, which follows a hearing in November last year, puts a question mark over whether the companies will keep their right to develop the asset into a mine, as there is a risk those tenements could be forfeited to other parties that made claims on them against the former owner. The Melbourne-based miner has not responded to the recommendation, but put its shares in a trading halt right after it. SQM, however, issued a statement in which describes the properties as a "requirement for the development of the Project". It also said the tenements were yet to be transferred to the joint venture. "Although this recommendation by the Warden’s Court is not a final decision on the requested exception, which should be made by the Mining Minster of Western Australia, it could generate uncertainty or delay the project," SQM said in the statement. Companies holding mining tenements in West Australia have a responsibility to develop them, which requires a minimum expenditure usually in exploration, which is set by the government. Kidman Resources bought the historic Mt Holland goldfield for $3.5 million in late 2015. It soon identified the asset’s lithium potential as well as the Earl Grey lithium deposit. SQM invested $110 million into Kidman in 2017 to jointly develop the 40,000 tonnes per year Mt Holland project and so be ready to meet an increasing global demand for the coveted white mineral, used in the manufacturing of the batteries that power electric cars. Experts expect the need for the commodity from battery makers alone to jump 650% by 2027, while overall demand is forecast to rise more than threefold in the next nine years. Both companies had demanded billions in compensation from one another. Germany´s high court has accelerated the enfranchisement of tens of thousands of adults with intellectual disabilities. The company last month said it would let Android users choose their browser and search engine but did not provide details. Danish and Estonian financial regulators have publicly blamed each other for the Danske Bank money laundering scandal. The amendment was approved 531-22-1. One conservative politician says the proposal smacks of East Germany-style socialism.